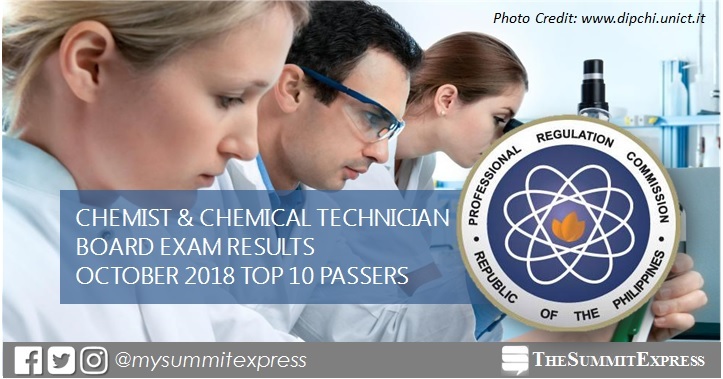 MANILA, Philippines – The full list of topnotchers or top 10 passers in the October 2018 Chemist and Chemical Technician board exam is available on this page as officially released on Monday, October 15, 2018 or in two (2) working days after the exam. In the October 2017 exams, Gio Ferson Maliksi Bautista of University of the Philippines - Los Banos (UPLB) topped the Chemist board exam with 93.00%. Diamond Jeff Romarate Paug of Cebu Institute of Technology (CIT) - University dominated the Chemical Technician board exam with 92.50%. In the October 2016 exams, Mikel Jason de Guzman Allas of De La Salle University (DLSU) - Manila aced the Chemist board exam with 93.50%.